You’ve heard the term “Cornerstone Content” or “Pillar Post” and now you’re wondering what that is. More than likely, you already know that the term is connected to your website’s SEO one way or another — that somehow, a pillar post can boost your rankings. But why? How? And what exactly is cornerstone content? 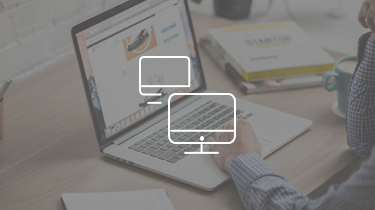 Cornerstone Content is a piece of long-form content that acts as the keyword foundation and starting point for the rest of your SEO strategy. 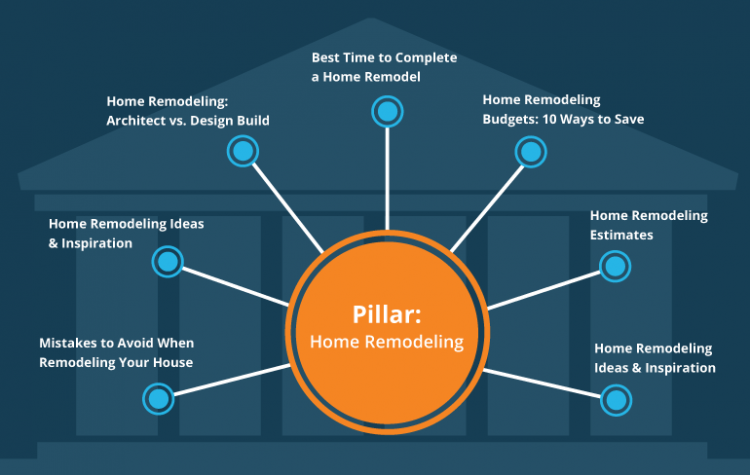 Think of a pillar post as the foundation (or pillars) upon which you build your SEO strategy. Basically, you write one really long blog post that surrounds a topic which is quite broad. 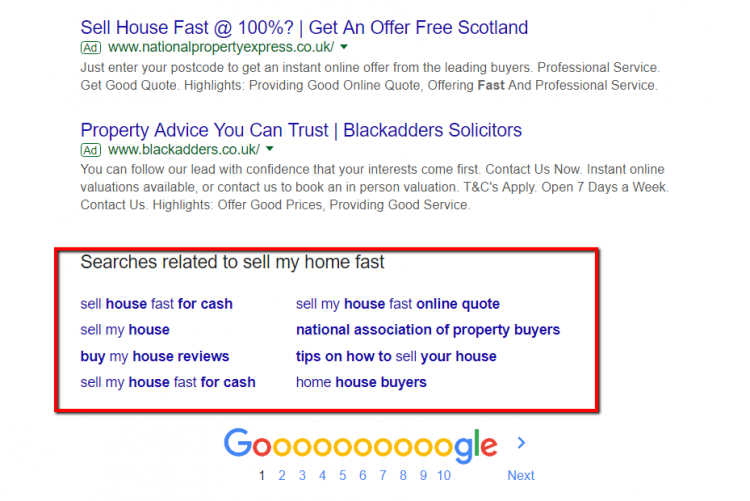 “Sell my home fast”, “first-time homebuyer”, or “cheap property for sale” would all be viable keyword phrases to target. This is your cornerstone content. Make sure you target a keyword phrase which is valuable to your business, has plenty of search volume (check search volume for any keyword phrase over here), and is broad enough to expand upon with other blog posts. Once you’ve chosen a keyword phrase to target with your cornerstone content piece, type that phrase into Google. Then scroll to the bottom of the page and find the LSI (Latent Semantic Indexing) keywords. To correctly build out your SEO content strategy, you’ll want to write an extra long piece of content (pillar post) targeting the keyword phrase that you typed into Google. Then, over the next few weeks or months, you’ll want to write an article for each blog post-viable LSI keyword phrase under that targeted phrase. 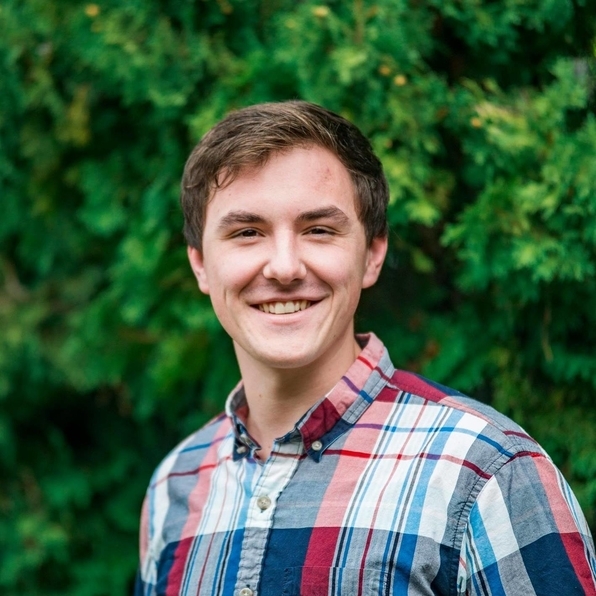 Finally, you’ll want to link internally between all of the content you put together. This works incredibly well in search engines for increasing your rankings. Because Google loves content that is organized and easy for it to understand. Google loves when it can easily determine what your blog content is about and then deliver it as search results for the most appropriate keyword phrase(s). Learn more about how Google Search organizes information. And this pillar-content strategy works for any niche, no matter how big or small. You could do this for your own real estate market to increase local rankings, or you could do it at a nation-wide scale (of course, the first will produce better results since there’s less competition). Try to aim for about a 3% exact keyword phrase density (meaning that 3% of the word count for each blog post should be the exact keyword phrase that you’re targeting). 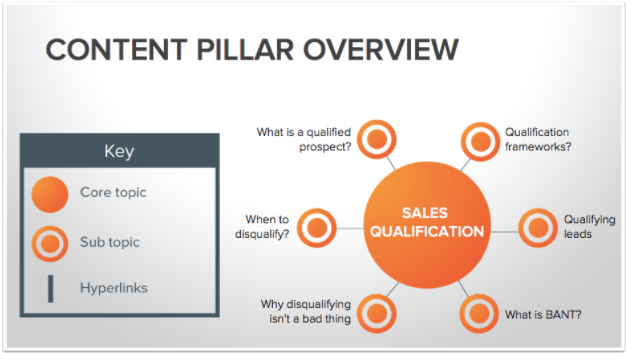 Here’s a quick list to simplify your pillar content strategy. Step #1: Write a pillar post that targets a broad keyword phrase — Try to make it longer (bigger word count) than all the other posts in Google. Aim for 3% keyword density (not too much higher or lower). Also, include every LSI keyword phrase that relates to your primary keyword phrase once within the article. 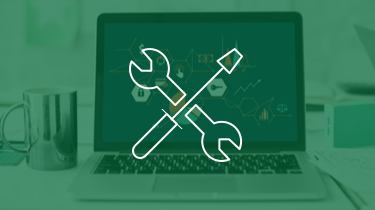 Step #2: Over the next few months, write one blog post for every LSI keyword phrase relating to your pillar post target keyword phrase — These articles can be a bit shorter than your pillar post article and go into more detail on their given topic. Aim for 3% keyword density for the post’s target keyword phrase. 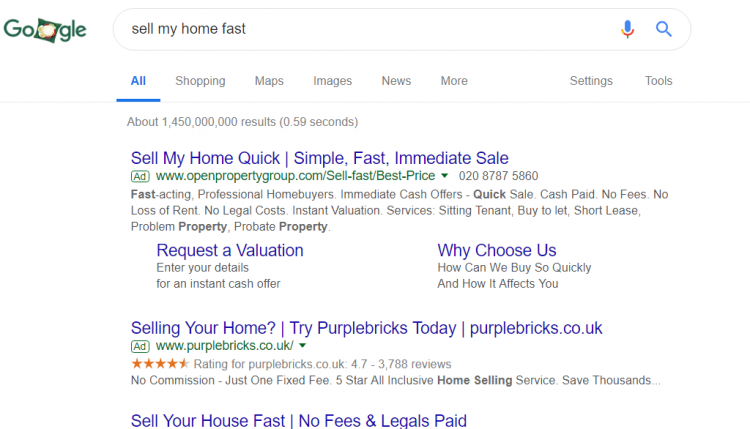 Include each LSI keyword phrase (the LSI keywords of the original pillar post, I mean) once within the article as well as the exact keyword phrase of the pillar post once within the article. Step #3: Link internally between each post upon the appropriate anchor text — Now that you have a large grouping of content which is topically related and has the keyword phrase of each other piece of content within each post, you’ll want to link to each post, from each post upon each article’s corresponding keyword phrase. Then, you’d write one article for each of those, and link internally between all of them. This organizes your content for Google and gives you a far higher chance of ranking in search engines then if you just put out random content every week (still better than nothing, of course, but not as savvy as having a pillar content strategy). Once you’re done doing this with one keyword family, you can move on to another keyword family and do the same thing. The more you do this, the better chance you have of ranking in Google and pulling consistent passive traffic to your website. 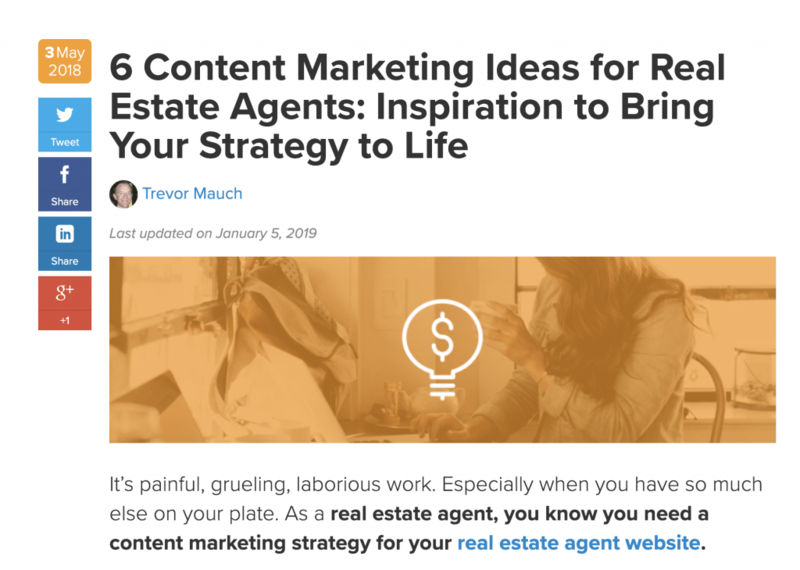 We then broke “6 Content Marketing Ideas for Real Estate Agents: Inspiration to Bring Your Strategy to Life” into multiple smaller posts based on each section headline. There you go. 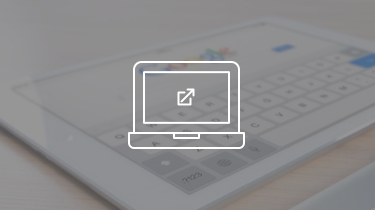 Now you can start creating cornerstone content that Google loves. And if you have any follow-up questions about building out your own content strategy, leave em’ in the comments and we’ll answer as best we can!